A dose administration aid (also known as a DAA or a Webster PackTM) contains individually sealed compartments to help you take the right medicine at the right time. DAAs help you reduce the chance of forgetting to take your medicine, and reduce the chance of taking your medicine incorrectly. DAAs may also be needed for patients requiring nursing care at home, or patients spending a period of time in respite or in a Residential Aged Care Facility. 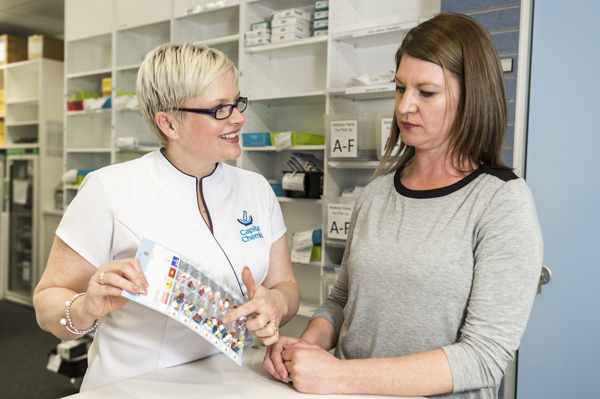 To commence with a DAA, your Capital Chemist pharmacist will need a chart or list of medicines from your doctor, and all your regular medicines and prescriptions that you have at home. A typical DAA lasts for one week, and we would normally issue two weeks at a time, but individuals can arrange a different supply interval if that is suitable. Changes to the medications in the DAA must be notified by the doctor and we would encourage you to take your pack with you to each doctor consult because it contains the current list of your regular medications. A fee is charged for the packing and supply of the DAA, and of course the patient is still responsible for the cost of the medications. Veterans’ Affairs patients may be eligible for fully subsidised DAAs.